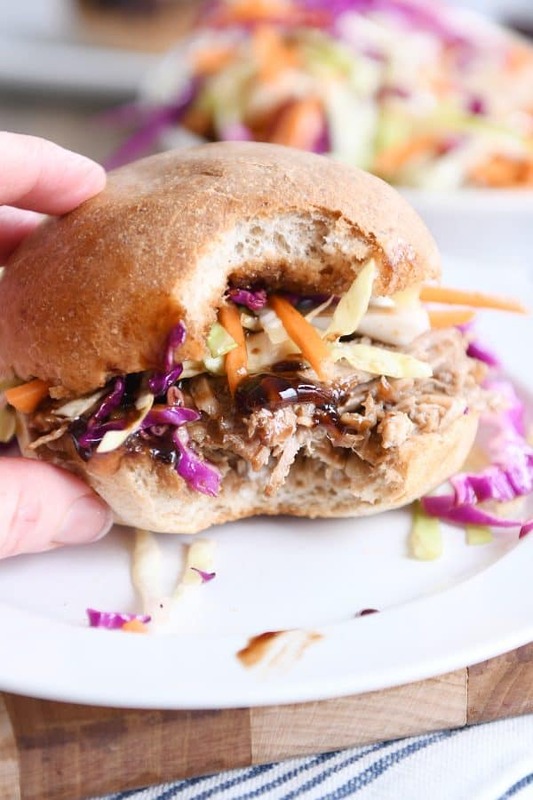 These flavorful honey balsamic BBQ pork sandwiches are so easy thanks to the Instant Pot or Slow Cooker! And wow, that BBQ sauce gets a huge boost thanks to a few pantry staples! BBQ pork sandwiches are an oft-recurring meal around here. I’ll never be able to take them off the rotation because a) hello, kid pleasing meal and b) they are so easy! This recipe has been my go-to BBQ pulled pork recipe for years. It’s an oldie (been livin’ here on the site for almost a decade), but man, it proves that it really doesn’t take a whole lot of ingredients or special tricks to transform a pork roast into a super tender, smoky-flavored, saucy sandwich situation. Because we eat BBQ pork often…either on sandwiches or salads or burritos or whatever…I’m thrilled to have another variation on the almighty BBQ pork. 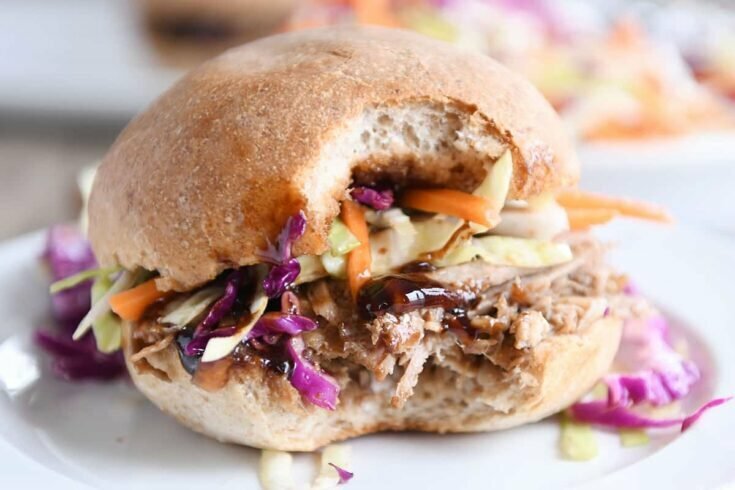 I’ll never turn my back on that classic first-love recipe, but this honey balsamic recipe is crazy good and perfect if you are looking to put a little pizazz into your BBQ pork sandwiches. You literally don’t have to overthink anything. The pork is seasoned with a little salt + pepper + garlic powder action and then thrown in the Instant Pot (oh yeah!) or slow cooker – both of which you can set and forget. While the pork cooks* everyday BBQ sauce gets amped up by the addition of a few pantry staples (honey + balsamic + Worcestershire), and lemme tell you, BBQ sauce never tasted so good. 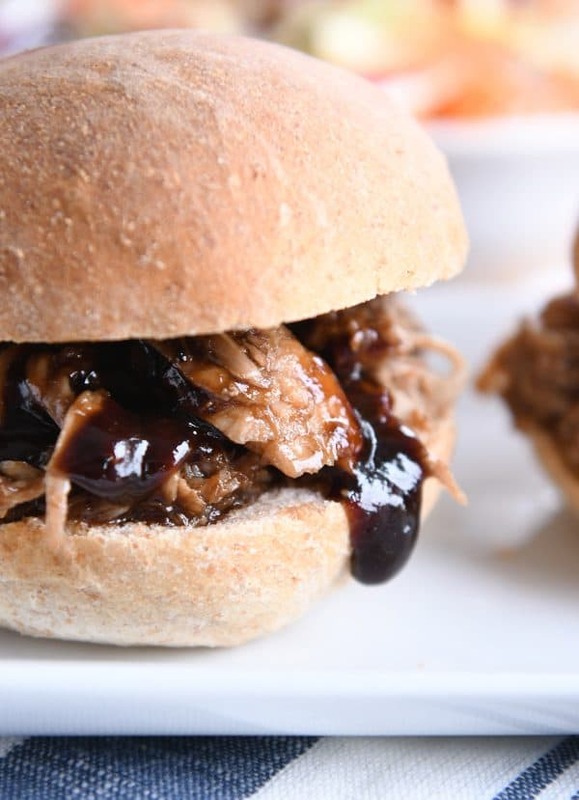 *the BBQ sauce can easily be made days (or even a week) ahead of time – just reheat before tossing with the pork! The most important part is choosing the right cut of pork (I recommend a pork shoulder or pork sirloin roast) and making sure you are using a BBQ sauce and balsamic vinegar that you already love. Life lesson #243: no amount of additional ingredients are going to change the flavor of a sauce you hate the taste of. Here are my preferences: I either use this favorite homemade BBQ sauce or Sweet Baby Ray’s (my go-to store brand). And for balsamic vinegar, I almost always use the Kirkland brand from Costco or the Bari Bari brand (that I order online). In the pictures of this post, you may recognize these fluffy whole wheat French bread rolls. 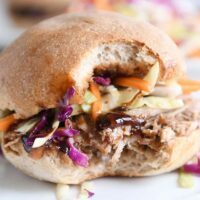 They are fabulous with this honey balsamic BBQ pork (or any pulled pork recipe), and I always double or triple the recipe so I can keep some baked rolls in the freezer. But hey, storebought buns work JUST FINE. If you like your BBQ pork extra sauce, just get a bun that is sturdy enough to soak up that saucy sauciness. Also, I happen to love topping my BBQ pork sandwich with coleslaw. Do you?? The contrasting flavors and textures speaks to my heart. Spoiler alert: only 3/7 of my family agree with me. We are a house divided. If you are a coleslaw + BBQ pork fan, here is my favorite creamy coleslaw recipe. However, in the interest of full disclosure, I must tell you that sometimes I just toss shredded cabbage and carrots in a bowl and sprinkle in vinegar, oil, a pinch of sugar and some salt + pepper for a non-creamy but ultra-yummo coleslaw fix. Season the pork roast evenly with salt, pepper and garlic powder (about a teaspoon of each). Instant Pot Directions: cut the roast in half and place in the Instant Pot. Pour in the liquid smoke and broth. Secure the lid and cook at high pressure for 60 minutes. Let the pressure naturally release for 10 minutes before quick releasing the rest of the pressure. Slow Cooker Directions: place the seasoned pork roast in a 5- or 6-quart slow cooker and pour in the liquid smoke and 2 cups broth. Cook on low for 8-9 hours. For the BBQ sauce, combine all the ingredients in a medium saucepan and heat, stirring often, until simmering. Simmer for 15-20 minutes until slightly reduced and thickened. Season to taste with salt and pepper, if needed. The sauce can be made a week in advance and refrigerated. If refrigerated, heat before tossing with the pork. Shred the pork (I suggest draining some of the excess cooking liquid) and toss with the BBQ sauce. 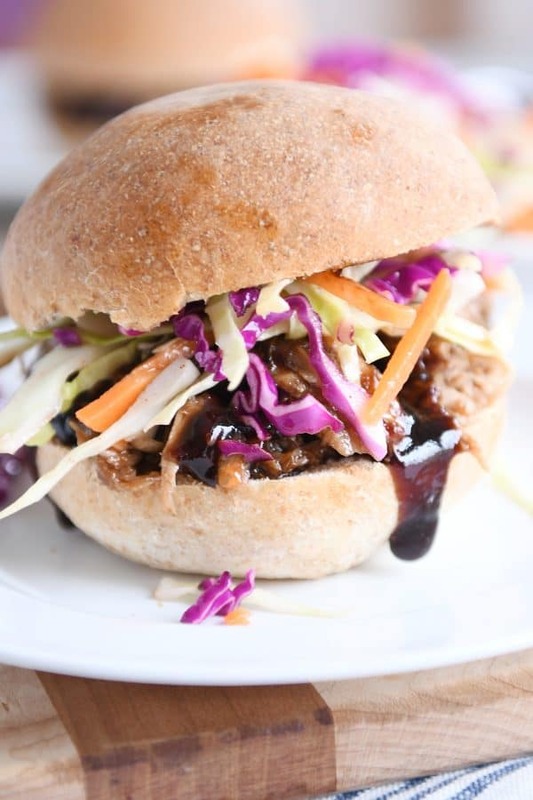 Serve on buns (shredded cabbage/coleslaw optional but delish). The pork (once tossed with the sauce) can be kept warm in the slow cooker or Instant Pot for several hours before serving. Choosing a BBQ sauce and balsamic vinegar that you like the taste of is key here. I either use my favorite homemade BBQ sauce or Sweet Baby Ray's brand, and my go-to balsamic vinegar is at Costco. Made this today via Slow Cooker & it was crazy delicious! Another winner and so easy! Thanks again! Husband and teen sons loved this, and so did I! I used a slow cooker and mine was done in just under 7 hours. Next time I will double the sauce so I have enough to mix in AND pour over (we like things saucy!). Thank you so much for another great recipe, Mel! I LOVE the idea of this but I think my first attempt went wrong somehow. Is the balsamic vinegar bbq sauce supposed to smell REALLY strongly and “off”? I think something might have happened to my balsamic vinegar, I don’t remember it to smell so strong normally even by itself so maybe mine is old? Can it go bad? It could’nt be two years old? I tasted a bit of the sauce with pork to see if it smelled weird and tasted good but no it tasted weird too! So we dumped the sauce and had good ol bbq on it instead. I’m so sad because I was so excited for this amazing sauce! Is it a mild sent/flavor? Hey Bri, I’m sorry this didn’t work out super well for you. The brand of balsamic vinegar will definitely make a difference. I’ve never known balsamic vinegar to go bad (especially since in many cases it’s aged anyway) but I suppose that is possible. I know the darker, thicker, richer the balsamic, the better. Some of the really thin, watery looking balsamic vinegars I’ve used from the grocery store aisle have not worked the best in recipes that are balsamic heavy. What brand did you use out of curiosity? I will say that this recipe is strong on the balsamic flavor but not so strong or weird that it is off putting (at least to me but I really love balsamic flavor). Can you use a bone in pork shoulder? I used a bone in roast the first time I made this recipe, my local grocery store had bone in roasts on sale for $0.98/lb., I couldn’t pass that deal up. It turned out fabulously. It was a bit difficult to shred off the bone, though. I want to make this today for a big Sunday dinner (3 days away). Do you think cooking in the IP, (as opposed to the slow cooker) & then freezing would be the best option for keeping it tender? Then I was thinking of putting the meat in the slow cooker on low Sunday morning to reheat for dinner that evening. Thanks so much! I think that sounds like a good idea! But I don’t think you need to freeze it for three days. I’d refrigerate and then reheat to serve. Did not have pork so made with chicken—delish! Also dialed down balsamic a little so as not to scare the kids. Happy to hear this worked well with chicken! Made this for dinner tonight. The flavor is amazing! So many of your recipes are in regular rotation because they are family favorites and we will be adding this one to our list. Thanks! This seems like a silly question… For the instapot, you said “cut the roast in half”… Is that just so it fits in the Instapot? Not a silly question! Mostly it’s so the roast cooks evenly and is more tender throughout (I’ve found that I like the results better when Instant Potting roasts to cut them in half or quartered). How many people does this recipe serve? I’m feeding 5 adults and 7 children. Is this enough? For future reference, the servings are listed right below the recipe title. I think you might need to 1 1/2 the recipe for that crowd unless you are making pretty small sandwiches. I like using Kings Hawaiian buns for pulled pork. With vinegar based slaw. Pulled pork and slaw go so well together. We love creamy cole slaw on our pulled pork but if we don’t have that, I put pickle slices on them. Great quick solution without coleslaw for a tangy crunch! Is there a link to the rolls recipe? Just a question, I need to make enough for 35 people. Ten of them are younger children. How would you suggest I do this? I have an 8 qt pot and a 3 qt pot. It sounds delicious! I would appreciate any help you could give me. Thanks! Let’s see, for 35 people, I’d probably triple the recipe (especially since you are feeding young kids). You could probably cook the majority of it in the 8 quart (maybe all?? especially if you cut the pork roasts into quarters and nestle it all in there – I’d increase the time a bit if the pork is crammed in) or take out part and cook in the 3 quart. OR make in advance and do two batches in the 8 quart. How do you feel about making this with chicken breasts instead of pork? Hmmm, I think it’s definitely worth a try. You’d want far less cooking time for chicken (both in the slow cooker and IP). I’d suggest 4-5 hours on low in slow cooker and about 15 minutes in the IP. What?? This is like divine intervention. I hope you love it!